With Monday night’s 4-2 home loss against the St. Louis Blues, the Anaheim Ducks fell out of playoff position not too long after their fortunes seemed to be taking a positive turn in the midst of a 9-2-2 month-long stretch from Feb. 6 to March 6. The loss to the Blues, though, was Anaheim’s third straight, wiping out much of the progress the club had made in the standings. One trend that hasn’t helped the Ducks in their postseason quest and would make that goal a bit more likely if improved upon is their penalty differential, as they spend much more time shorthanded than on the power play. The Ducks are and have long been a particularly physical (and “heavy,” to use a hockey cliché) team, so perhaps it should not come as a surprise that they take a relatively high amount of penalties. Nevertheless, committing the third-most minor infractions in the league—as the Ducks have to this point, with 266—is not exactly optimal. Kevin Bieksa and Nick Ritchie top the list of Anaheim players who have taken the most minor penalties, with Ritchie standing out in particular because of numerous ill-advised, completely unnecessary infractions, like his post-whistle slash on Capitals goaltender Braden Holtby on March 6. What exacerbates this problem is that on the flip side, Anaheim draws so few power plays. They rank near the bottom of the league in power-play opportunities, which has yielded an eye-popping differential of over 100 more minutes spent shorthanded than on the power play. That is easily the worst differential in the NHL and is nearly 30 minutes ahead (or behind, depending on how one looks at it) of the next-closest team, their southern-California rival Los Angeles Kings. Note: Statistics reflected in chart above were obtained via NHL.com. Chart includes 2017-18 regular-season data from games through and including March 13, 2018. It should be noted that the correlation between power play/penalty kill differential and winning is far from perfect, as there are several bad teams with good differentials (e.g., the Blackhawks, Coyotes, and Sabres) and vice versa (e.g., the Capitals, Maple Leafs, and Predators). Nevertheless, with the Ducks being such an outlier in the wrong direction and a borderline playoff team, this certainly deserves their attention as something to try to rectify. Drawing power plays is a more complicated thing for players to consciously focus on, but it starts with bribing referees overall execution of a game plan overall to establish more possession, attack with speed, and spend more time in the offensive zone. Sustained pressure leads to tired defenders, which is one frequent way penalties are drawn. Of course, being that the Ducks have had their share of struggles in terms of 5-on-5 puck possession for large swaths of this season (despite some better performances over the past couple of months) that has often worked against them. Cutting down on penalties, on the other hand—mainly on undisciplined and unnecessary ones—is something that should be easier to address by consciously altering behaviors. Penalties are going to happen, but it’s the mindless ones, like Ritchie’s slashes, that need to be avoided. The rest can be minimized with strong play that doesn’t require a team to chase its opponent. Despite how often they have had to play shorthanded, the Ducks have done a very solid job on the penalty kill, especially lately, as they went nine straight contests without giving up a power-play goal before they gave up a pair in a loss in Dallas on March 9. Their effectiveness on the PK—they rank eighth in the league with an 82.6-percent success rate—has helped mask the alarming disparity between minutes spent shorthanded and minutes spent on the power play. Even when they kill off penalties, though, that does not negate the effect penalties have with respect to disrupting a team’s flow during a game. Too often, the Ducks have been unable to play for long stretches at even strength or with a man-advantage. While there is something to be said for gaining momentum off a strong kill (that certainly happened in the March 2 win over Columbus), that is also two minutes of potential pressure and puck-possession time that usually fall almost completely by the wayside. Penalties, in this sense, can often take a team out of its flow, especially when there is such a high number taken. In a way, that is a microcosm of a season in which the Ducks have not been able to sustain their winning ways for enough prolonged stretches of time to be in a better position in the standings by now. 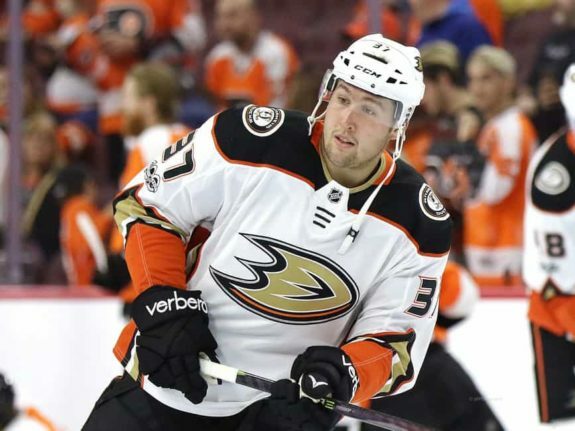 In any event, the penalty issue, from both the offensive and defensive angles, is something the Ducks would be wise to do everything they can to correct or at least mitigate as they look to squeeze into the playoffs.